Calling all cookie dough ice cream fanatics — your prayers to the ice cream gods have been answered. And by ice cream gods, we clearly mean Ben & Jerry’s. The purveyors of delightful frozen goods just introduced three varieties of edible cookie dough bites sure to make you feel #blessed. Dubbed “Cookie Dough Chunks,” the sweet treats come in classic chocolate chip, peanut butter chocolate chip and non-dairy vegan chocolate chip. Praise be, indeed. For those lucky enough to live in Vermont, Cookie Dough Chunks have been readily available since last year, when Ben & Jerry’s rolled out half-pound bags of the classic chocolate chip and peanut butter chocolate chip varieties. Fortunately for the rest of us, the Green Mountain State loved the dough balls so much that the company decided it would be a disservice not to offer the confections nationwide (Dear Vermont, *fist bump*). Considering cookie dough is Ben & Jerry’s most popular flavor globally, we’re surprised they didn’t realize the potential brilliance of this edible expansion even sooner. Make no mistake, there’s a lot to love about these little guys. For starters, they won’t give you salmonella poisoning, which we always file under the “pros” column in our foodie journals. Since Cookie Dough Chunks contain pasteurized eggs and heat-treated flour, they’re a safe snack. Also, and we probably don’t have to stress the significance of this to self-professed “cookie dough spelunkers,” no tunneling is required. There’s no ice cream to carve through in search of elusive dough balls. No chunk-chasing. These bags are bursting with cookie dough balls. Full stop. If you’re worried that perhaps the individual chunks won’t taste the same as the traditional embedded-in-ice-cream version, well, don’t be. 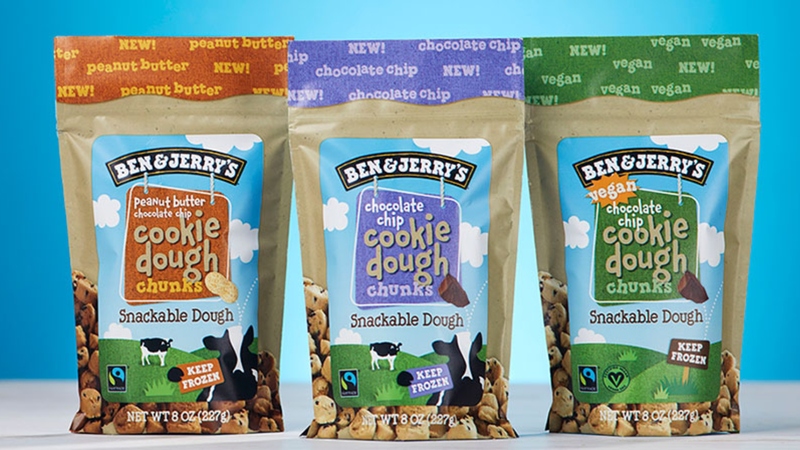 Per the company, Cookie Dough Chunks are created using the exact same cookie dough you’re accustomed to digging out of pints of Ben & Jerry’s. So, obviously, you’re going to want to get your hands on a bag (or three) as soon as possible — and there’s good news on that front, too. This sweet snack is now available at participating retailers nationwide for $4.99, as well as at Ben & Jerry’s Scoop Shops.